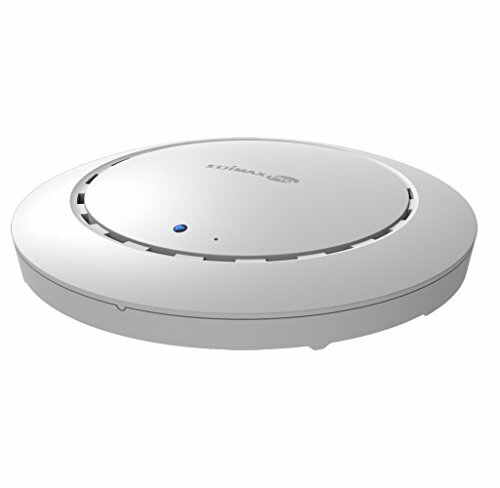 The CAP300 is a reliable and affordable entry level wireless access point designed to meet the needs of modern small to medium sized businesses, with IEEE802.11n wireless speeds up to 300Mbps. Industrial-grade performance and build quality combined with user-friendly operation, an extensive feature set and a practical, ceiling-mount design make an ideal product for day-to-day enterprise use. For businesses that demand security, flexibility and speed - the Edimax Pro series has a wide range of potential applications from office environments to schools, campuses, hotels and hospitals. Multiple SSIDs can be configured for different departments or user groups and a built-in RADIUS server provides additional verification with a scalable AP array architecture for central management of multiple access points. Fast roaming for seamless transitions between access points, Power over Ethernet support (PoE) and an intuitive web-based management interface provides flexibility for deployment and extensive management options for company MIS departments and network administrators. When performance and security are critical for your business, you need products that are engineered for your industry. The Edimax Pro series is designed to help your business and provide the connectivity that you rely on every day, with safety and effectiveness guaranteed. 802.11N High Speed: IEEE 802.11n with 300Mbps wireless speed. Easy Installation: Ceiling-mount & T-rail mount design with easy installation kit. Compact & Durable Housing: Ultra slim design with UL94-5VB flame-retardant plastic housing. Central Management: Edimax Pro Network Management Suite (NMS) , easy and Intuitive web-based central management suite, supports AP array architecture. If you have any questions about this product by Edimax, contact us by completing and submitting the form below. If you are looking for a specif part number, please include it with your message.